It is well known that the adoption of conscription in Canada during the First World War was very unpopular in Quebec. Although many Quebecois volunteered to serve in the army in the first years of the war, large numbers of French Canadians disagreed with sending troops overseas when the country did not seem to be threatened. What is less known is the fact that Canadians in the rest of the country also opposed conscription. Winnipeg was no exception and there was a good deal of resistance in the city. Canadian men volunteered in large numbers during the first two years of the war, but by mid-1916 numbers were falling off. Part of the reason for the drop was that there could now be no doubt about the experience of trench warfare. Newspapers carried columns of pictures of the casualties every day and, not surprisingly, men thought twice about going to war. That July, news of the vast Battle of the Somme and the incredible casualties it produced began to appear in the papers. As it became clear that Canada was no longer able to attract enough volunteers to replace the dead and wounded, let alone enlarge the army, Prime Minister Robert Borden’s government began to prepare legislation to establish conscription. This was done with the knowledge that it would split the country – and in spite of the promises made earlier in the war that the Canadian force would be an army of volunteers. When the war began in 1914, the European powers had a system of conscription under which certain classes of young men were taken into the army for a period and then spent another period of time as reservists, liable to be called up in case of war. Only Great Britain and some of her Dominions, like Canada, did not have conscription. There were many reasons for this, not least being the reliance upon the navy for defence. But there was also a tradition that the British were a free people who should not be coerced into serving in the army. Then there were the men who simply did not show up when they were called to report and join the army. Winnipeg was second only to Montreal in the percentage of men who did not report or defaulted – almost 20 percent of those conscripted compared to around 25 percent in Montreal, according to reports published in the Winnipeg Telegram at the time. These men were pursued by the police and could receive heavy jail sentences if caught and tried. The initial success of great German offensive in spring 1918 was so alarming that regulations were changed. It became more difficult to get exemptions. Eventually large numbers of conscripts arrived in France and Belgium in time for some to take part in the final Allied push in the last hundred days of the war. Probably the most famous of Winnipeg’s conscription opponents was Fred Dixon, the M.L.A. for Winnipeg Centre and one of the province’s most important left wing politicians who began to speak out about conscription in early 1917. Dixon’s objection was similar to that raised by many labor leaders – men should be conscripted only if their wealthier counterparts were also “called up” to help in the war effort. But Dixon went further, echoing the arguments put forth by British socialists like Kier Hardy. He declared that conscription was slavery and questioned the idea that the war was being fought to preserve freedom. In speeches, Dixon demanded the Allies to prove that this was so and he announced he did not intend to die for a myth. His approach was that of a pacifist, but one inspired more by humanist thought rather than religious teachings. 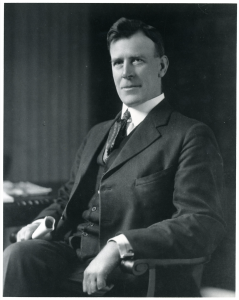 In the overheated atmosphere of wartime, Dixon’s speeches were unpopular with many people, especially soldiers who had returned with wounds and disabilities. While addressing a meeting in Brandon in January 1917, Dixon was interrupted by hecklers and a voice that shouted out “God save the King” at the end of his talk. Dixon replied, “God save the people.” On June 4, 1917, he addressed an anti-conscription rally broken up by a group of returned soldiers. While most of the speakers left through a back door, Dixon stayed, and was punched in the nose. He hit one of the soldiers in the jaw and retreated into the theatre where he waited until the police came and got him safely out. The soldiers marched back to their headquarters carrying Dixon’s hat as a trophy. A group tried to have Dixon expelled from his seat in the Legislature and circulated a petition in his Winnipeg Centre constituency calling for his expulsion. The petition received very few signatures. Dixon was popular and usually won his constituency with large pluralities. Religious Winnipeggers in some cases opposed conscription and war in general. The Quakers, Mennonites and Doukhabors were all specifically mentioned in legislation as groups whose members were exempt from military service because of their pacifist beliefs. It was sometimes possible for members of other religious groups to be assigned to non-combatant roles in the army if they joined. After the introduction of conscription this was the way in which many religious conscientious objectors managed their situations. The Russellites, now known as Jehovah’s Witnesses, were not so willing to make accommodations. After the group’s application for an exemption on the basis of their pacifist beliefs was denied, they refused to report for duty when conscripted. When arrested in early January for not reporting, they refused to sign the oath of loyalty or even to put on the uniform. In Winnipeg three members of this group, Robert Clegg, Ralph Naish and Charles Matheson were taken to the basement and given ice cold showers to try and force them to put on the uniform. Matheson gave in, but Clegg and Naish did not. Word of their mistreatment got out on January 25, 1918, when a fellow soldier, Private Paul Case wrote to the Free Press and the Winnipeg Telegram saying he and other soldiers deplored the treatment Clegg and his fellow religionists had received. There was an inquiry and the Sargeant who had given them cold showers was charged with hazing and eventually judged to be innocent. Naish and Clegg were court martialed along with a number of others and sentenced to two years in prison, though they were sent to England instead, and were mistreated and threatened during training. They made it home to Winnipeg after the war. Conscription divided Canadians and was opposed not just in Quebec but in other parts of the country, including Winnipeg. Jim Blanchard recently retired as Head of Reference Services at Elizabeth Dafoe Library at the University of Manitoba. He is the author of two award-winning University of Manitoba Press titles, Winnipeg 1912 (2005) and Winnipeg’s Great War: A City Comes of Age (2010).